Are there options for having a 3D human brain model combined with a system model for conditions such as hypertension and diabetes? A full hypertension model or diabetes model will include a representation of the human brain. This style of 3D human brain model is designed to highlight the effects of these two conditions on the brain. This highlights the very real increased risk of stroke. The brain in these models shows the internal structure with the stroke occurring within one of the lobes of the brain. Very detailed anatomical representation of the brain is not common in these models since the goal is an overall understanding of the disease or medical condition. A good option is to combine a basic brain model with the model that shows all conditions associated with the specific disease. This allows for more detail when necessary without confusing the information supplied on the disease model. What is the best type of 3D human brain model for an advanced anatomy class or laboratory? An ideal 3D human brain model for advanced types of study is a brain that is located in the skull but also fully removable. This unique combination of brain and skull model provides the student will a good understanding of how the brain is located in the skull and where brain sections correspond to the outside of the skull itself. The brain model that is removable allows from maximum understanding of the healthy brain as well as the various common pathologies. If the brain can be removed and divided, a greater number of pathologies can be clearly and effectively represented. In addition details provided on an educational card that corresponds to the brain model provides further information of the pathologies depicted. This is an ideal study tool and one that is both interesting and engaging for student's to use in basic or advanced level anatomy and physiology classes. I need a basic 3D human brain model that clearly shows the parts of the brain. Is there a detailed option that doesn't include any pathologies? A basic 3D human brain model shows the right side of a human brain with all the external and major internal features. This is sometimes referred to as a sensory motor brain. Each component or part of the brain is colored differently to contrast and provide clarity as to the various sections. This brain is a normal size adult brain that is free from any pathology. The major focus of this model is to allow students and patients to clearly distinguish the various parts of the brain. This includes the lobes as well as the internal structures. Details include the olfactory bulb, optic nerve, optic chiasm, mammillary body and the medulla oblongata which are all associate with sensory functions. 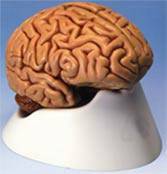 This type of 3D human brain model is very beneficial in all types of educational settings as well as in working with patients. For example, using this model with stroke survivors is helpful in explaining the deficits they are experiencing as well as the options for rehabilitation and recovery.